Thirteen years after her early death, Linda McCartney's family has paid tribute to her art and her life with Life in Photographs. 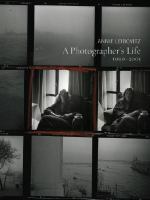 This beautiful oversized volume was selected from her archive of more than 200 000 photographs. Linda Eastman had made a name for herself in the music scene in the 1960s before she became even more well-known as a Beatle wife. Her first break was to be selected to photograph the Rolling Stones and was the first woman to have a portrait (Eric Clapton) on the cover of Rolling Stone. Her marriage shifted her focus from being a working photographer to capturing moments in the lives of friends and family. This collection goes far to lift the shadow of Beatle/McCartney fame and showcases her creativity and passion. 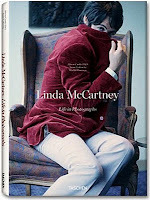 McCartney's photographs are striking in their simplicity. Subjects aren't posed and there is no sense of a complicated production team. McCartney had a way of sensing a moment and unobtrusively capturing it. The photographs of her children are particularly touching. The children, who must have been continually photographed throughout their lives, did not appear to notice the camera. McCartney excelled at capturing a glint in the eye and a sense of playfulness. This collection includes photographs which have been seen before - Paul with baby Mary zipped up in a sheepskin jacket, Jimi Hendrix (I thought the one with Jimi Hendrix yawning was charming), Rolling Stones, Beatles. Portraits of family life, including Paul at play with the children, a chocolate covered Stella, their home in Sussex and the horses, add a personal and intimate element. "Linda found her stride in her photographs of her family. My favourite photograph in this book is the one of the dining table at the farm in Scotland. Paul is there, at the edge of the picture, photographed from the back, but the subject is the minutiae of family life. A half-open bottle of wine and a baby bottle with juice. Letters, notes, crayons, dirty dishes. It's wonderful to have photographs like that. Photographs of what she saw and lived."